Years before Ed and Lorraine Warren (Patrick Wilson and Verga Farmiga) encountered the horrors of Amityville, the demon doll known as Annabelle, and countless other supernatural forces, an even more powerful evil would be released upon the grounds of an abbey hidden in the hills of Romania. Seeking miracles and answers the Catholic Church would deploy Father Burke (Demián Bichir) and the young and impressionable Sister Irene (Taissa Farmiga)– what the two would find was nothing shy of hell. Now to sanctify the grounds and send the evil packing from whence it came…or is it too late? Written by Gary Dauberman and James Wan and Directed by Corin Hardy this jump scare (often telegraphed) extension of the Conjuring cadre aims to play upon the foundations of demonic possession but instead falls flat with the same mechanism of terror/horror on repeat. Confusing matters further, nods to the Evil Dead franchise and curious smatterings of humor throughout create for an odd tonal pairing, not necessarily wrong, just odd, end result, underutilized resources and missed scares, especially from the work of the titular Nun played by Bonnie Aarons, ultimately our villain gets a surprisingly low amount of screen time. And, coming in with a runtime of 96 minutes welcomes aren’t overstayed, but then, they aren’t encouraged just the same. 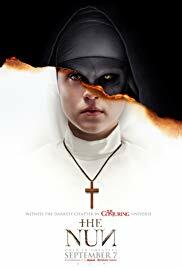 Perhaps making the rental list for a later date in the winter when the skies are already dark, The Nun is rated R.
Having watched her entire family slaughtered by a hispanic gang Riley North (Jennifer Garner) breaks bad to become a lethal weapon with a mind set on revenge; a death wish mission to destroy the people and system responsible for her loss. Blood spattered, Riley’s luck will only run so long, just how far will she get before her targets and law enforcement catch up with her instead? Written by Chad St. John and Directed by Pierre Morel this bloodbath of a revenge flick heralds Garner’s return to action, which on paper sounds rather interesting, that is until we’re doused in cheese whiz, laughably bad dialogue, tired plot devices, and heavily stereotyped and inept villains. Yawn. Easily forgotten in the barrel scraping action of the summertime dregs, not even heavily dosed brutality seems capable of lodging a foothold in this shoulder shrugging 102 minutes of guns blasting and fists flying. Try again Jen, you’ve still got the legs and wits to carry something like this, but, next time lets aim for stronger story content. 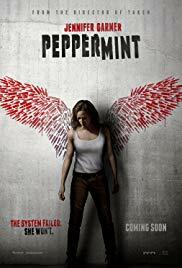 Peppermint is rated R.